Holiday Safety Tips from Shiloh Veterinary Hospital! Holiday decorations are a staple of the holiday season. Remember that these decorations can cause problems for your pet. Ribbons and tinsel are especially attractive and hazardous to cats. Keep an eye on electrical cords and tree lights to insure puppies and kittens don’t chew on them. It is also wise to make sure that you place your most delicate ornaments at the top of the tree so that your pets cannot knock them off the tree and accidentally break them. Mistletoe and holly can cause vomiting and lilies are often deadly to cats. Poinsettias, despite their reputation, are not deadly but can cause some an upset stomach. If you have more questions regarding potential hazards to your pet please give us a call. We’re sure that you’ll agree with us when we say that best thing about the holidays is the food! And with all of the chaos that will surround your kitchen this holiday season, it is extremely important that you watch everything that falls form the counter tops, because you can be sure that your pet will be watching with an eagle eye! There are good reasons for not allowing your pet to consume any human food. Consuming turkey bones, processed food, or other seasoned and prepared meals can leave your pet feeling sick for days. And if you thought that preparing all of the holiday food was hard work, try planning a holiday dinner all while taking care of your sick pet! If you want to treat your pet on the holiday, a little properly cooked Turkey or other meat can be perfectly safe to give your pet. Please make sure that you ONLY give them the turkey, meat or chicken that has been prepared with NO SEASONING, or rinse the meat prior to giving it to your pet. As we all know, the holidays are the busiest days for all of us all. Between family coming and going and the craziness of shopping, cooking and celebrating, your pet may be feeling a little left out. Please be sure that during this hectic holiday you make the opportunity to enjoy some good quality time with your fury companion. 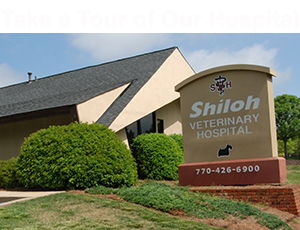 From our family, to yours--all of us here at Shiloh Veterinary Hospital are wishing you a very happy holiday season.